A brand that seems to be making its way into some decent press lately (and with good reason) is Ystudio, a small Taiwanese company that began in 2012 with a vision to create products that were more than just "products", but unique artifacts that create purpose in their use. Works of art made from raw materials like brass, copper, and wood, that promote a desire to be used and appreciated. Their series, "the weight of words", are a variety of writing instruments that may seem somewhat simple (yet quite unique) in design, but are beautifully and meticulously crafted. The pen I'm reviewing today is my second experience with a Ystudio product and I'm thrilled to provide another more in-depth review as I really enjoyed the first. I was sent the brass rollerball pen by Kohezi of Amsterdam, a lovely online store that has a curation of goods that fit a very modern and clean aesthetic. I could peruse their selection all day... Please take a moment to visit their shop, and special thanks to them for sending the pen for review. 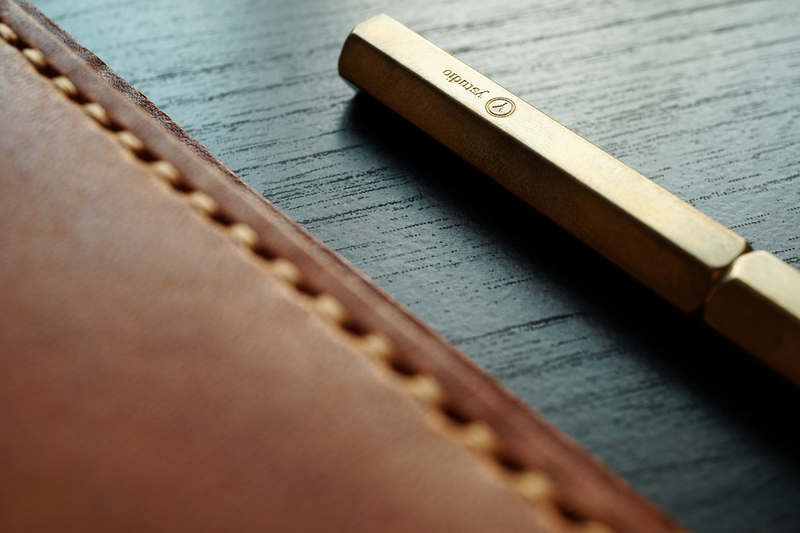 The rollerball pen is part of "the weight of words" stationery series mentioned above and is made from solid brass, but with some copper accents neatly tucked away at the ends. 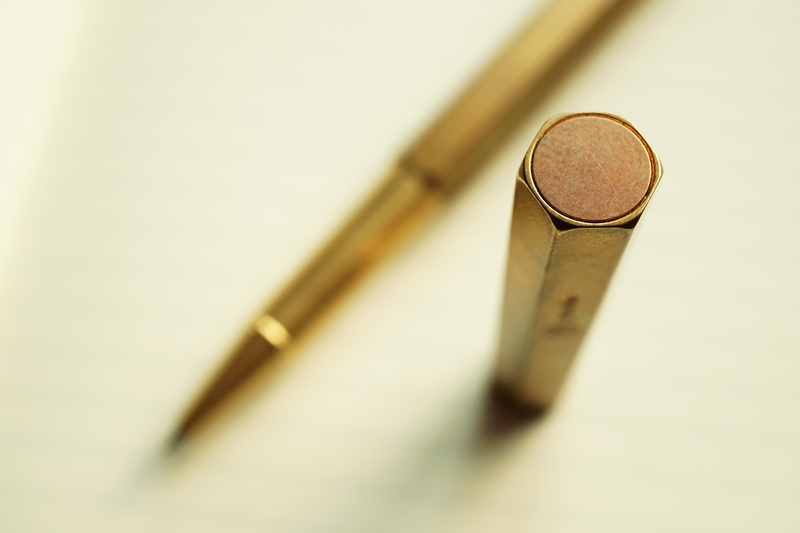 Being raw brass, the pen is hefty at 1.5 oz, but since the cap doesn't post, the writing section is a comfortable 1.0 oz. Almost immediately upon using the pen it has begun to acquire an aging and patina that gives it a worn in look. The barrel and cap are a faceted hexagon shape with rounded, but distinct edges, and the weathering look blend nicely into a unique aesthetic. There are pens that are so simple, but are beautiful in their own way and I feel that Ystudio has created exactly the experience they intended. Apparently this is version two of this particular rollerball, the first being a threaded cap/barrel, but to remove the cap you simply pull on a pressure fit system. It is snug, but not tight and easy to remove. It is difficult to see up inside the cap as to how this works exactly, but there is a slight ridge on the grip section that "catches" on some sort of o-ring or spring. There is one piece of plastic in the pen, up near the finial inside the cap, but I'm not sure what purpose it serves. The refill that comes with the pen is a Schmidt Safety Ceramic rollerball which is a great writer and is easily available. It is held in place by a flush copper set-screw in the end of the barrel that can be removed with a coin, or potentially a fingernail if it isn't too snug. Sometimes you can easily swap out this size of refill with a Pilot G2, Pentel Energel, or other similar gel pen, but upon trying the opening for the tip seems to be too small to allow for more options. But, I can confirm that the Schmidt Fineliner refill fits perfectly if you like a more expressive line. I have to admit, a pen like this makes you want to use it which says a lot in my opinion. Not only for what it is doing while writing, but just the act of using it is enjoyable. The Ystudio rollerball pen runs around $100 which I feel is a fair value for the pen as it is unique and very well made. I've paid similar amounts for other brass pens like this and don't find the price outrageous. Special thanks again to Kohezi for sending the rollerball my way to share. In addition to the rollerball version of the Ystudio pen, they also have a wide range of other pen/pencil types to fit other preferences.